"A dreadlock and uniformed Police officer shot and killed the form four student in Kisumu, revealed." Says an eye witness. - Bana Kenya News, Real African Network Tubanane. Home News "A dreadlock and uniformed Police officer shot and killed the form four student in Kisumu, revealed." Says an eye witness. "A dreadlock and uniformed Police officer shot and killed the form four student in Kisumu, revealed." Says an eye witness. A form four student who was shot dead by Police during the Anti-IEBC demonstrations in Kisumu will be buried this weekend. The Kenya police forces have denied killing the student but an eyewitness said a police officer with dreadlock started to shoot directly to people and got the child. The Police then got into a Pro-box car and joined the other officers. Witnesses claim the student was killed by a man in dreadlocks and in police uniform. The man is said to have driven away in a Probox after shooting the student dead. Police boss in Kisumu has denied the allegations saying his police officers were not behind the brutal murder of a form four student during NASA's anti-IEBC protests on Monday, October 16. According to Kisumu county Police Commander Titus Yoma, investigations have been commenced into the brutal murder of the student, 18-year-old Michael Okoth. Yoma said early reports indicated the killer escaped in a Probox after bringing down the student who was buying ice cream. 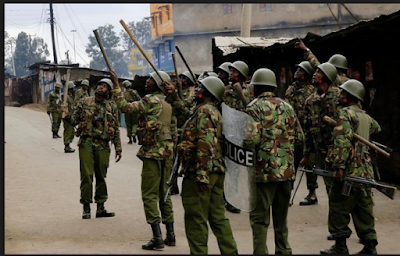 The Police have been in constant attack following a report tabled by the Kenya Human Rights Commission and Amnesty International saying that almost 50 People from a single tribe/community were shot by Police in Uniform. The NASA leadership said that the demonstrations will continue until the IEBC conduct reforms, otherwise, no elections will be conducted on the 26th October 2017.